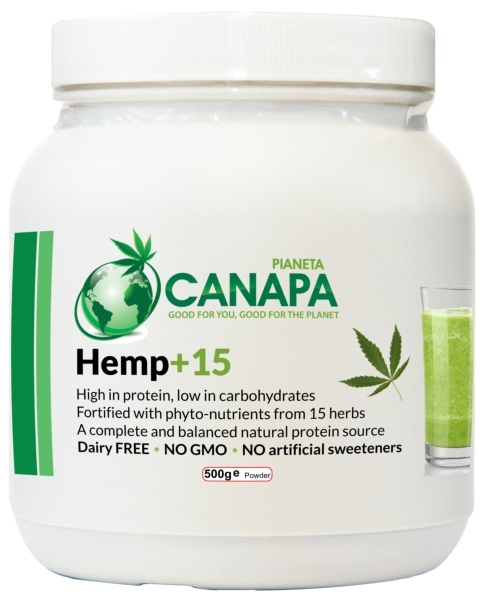 So, if after reading these tempting recipes you want to buy hemp protein powder, we have our own brand product, Hemp+15 with 15 beneficial herbs. If you are fed up with highly processed protein powders that leave a bad aftertaste, full of artificial sweeteners, flavours and other chemicals, GMOs, dairy products, sugars, or with protein powders that make you feel bloated and that are not suitable for children, Hemp+15 is for you. 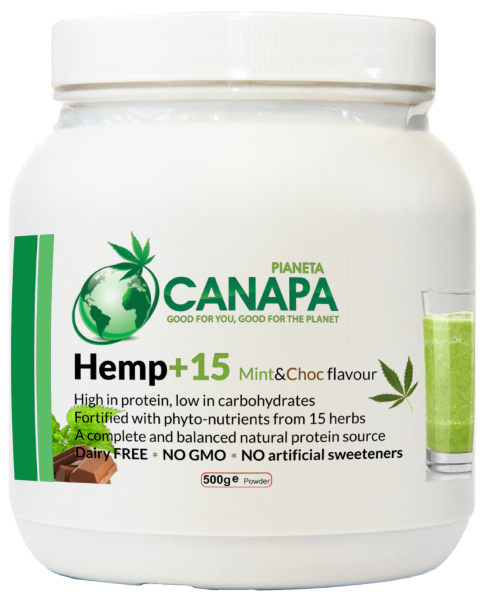 Pianeta Canapa's Hemp+15 contains only 100% natural ingredients, hemp and 15 superfoods and herbs and it is very easily digestible. Produced in the UK. Contains no: added sugar, gluten, dairy, lactose, GMOs, hexane, pesticides, herbicides, colours, additives or preservatives. As you can see in this website, you can eat Hemp+15 both raw, mixed with fruit juice, yogurt, milk alternatives or used when cooking. It is great mixed with soups. You can take 15g - 30g (2-4 teaspoons) 1 - 3 times per day. We have combined hemp, a complete, balanced and natural plant protein, with 15 other beneficial herbs and superfoods to set this product apart from single-ingredient hemp protein powders. *Contains 90% hemp protein and 10% beneficial herbs and superfoods. There are different ways to buy our hemp protein powder. You can find it only online, from this website. or get 10% discount and buy it from PianetaCanapa. Click here. Here below, select your country, click on the Add to cart button and choose your favourite method of payment. 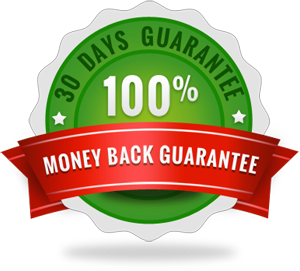 It is suitable for athletes, bodybuilders, slimmers, vegetarians and vegans, raw food eaters, food intolerances, low-carb diets, even for the elderly and kids as it's all natural. Go from Buy hemp protein powder to What is hemp protein powder? Di' la tua su quello che hai letto! Lascia un commento qui sotto. Solo giovedì 19 Luglio, con una spesa di almeno €??? (scoprilo subito), ricevi in omaggio una confezione di Latte Detergente Canapa e Uva Rossa da 200 ml! 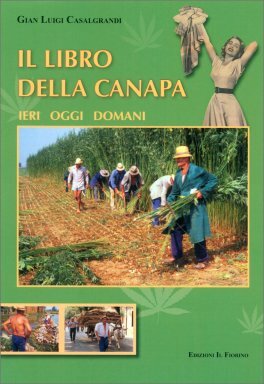 (non un campioncino).